Timed to coincide with the 50th anniversary of the publication of the Watson-Crick double helix model, and with a PBS series on the history of DNA hosted by Watson, this blockbuster recaps how it happened, what came before, where we are today, and what the future may hold. And does it well. From Darwin through the eugenics movement, from the fruit-fly boys at Columbia at the beginning of the 20th century through the Collins-Venter race for the human genome at the end, it’s pretty much all here: the sterilization laws and the Holocaust, biology after WWII, pioneers like Oswald Avery, who realized it was DNA and not proteins that held the secret of life, and how W and C got it together. It’s a twice-told tale, but worth retelling, especially as pains were taken to make it generally accessible. Indeed, while the text is written in Watson’s voice, credit must surely go to Berry as an able co-author. 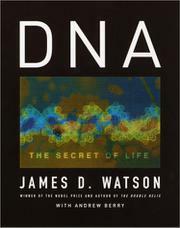 What makes this exceptional is the extent to which it explores everything that’s happened since 1953: “Playing God” fears about recombinant DNA and genetically modified (GM) foods; the use of DNA fingerprinting; DNA analysis to determine our African origins; the hunt for the genes for Huntington’s disease, cystic fibrosis, breast cancer, and other scourges; the pros and cons of genetic testing and building DNA databases; the difficulties of gene therapy; and the potential for genetic enhancements. Unsurprisingly, Watson (Girls, Genes, and Gamow, 2002, etc.) favors GM foods, sees value in DNA databases, laments the under-use of genetic tests, and has it in for Craig Venter and firms that guard gene patents. Never shy about espousing politically incorrect views, he would like to see behavioral genetics research proceed and favors germline therapy—not tomorrow, but as we learn more. Optimism pertains throughout: Watson sees the evolution of human cooperation and love transcendent over gene enhancement for the rich and famous. A grand tour of epochal events in biology history.